Hi, everyone! 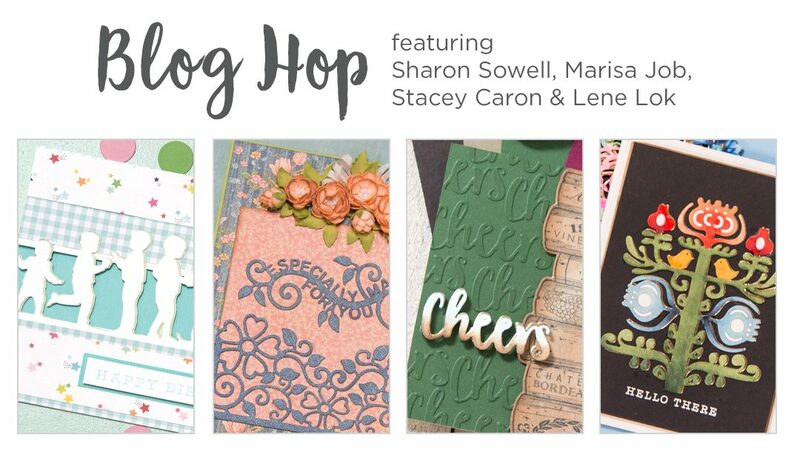 It’s Emily Leiphart here and I’m thrilled to be guest designer on the Spellbinders blog to help showcase the new Folk Art Collection by Lene Lok. 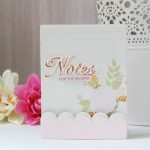 I love using dies in unique ways and I’m here to share some ideas for the Kurbits 2 die. 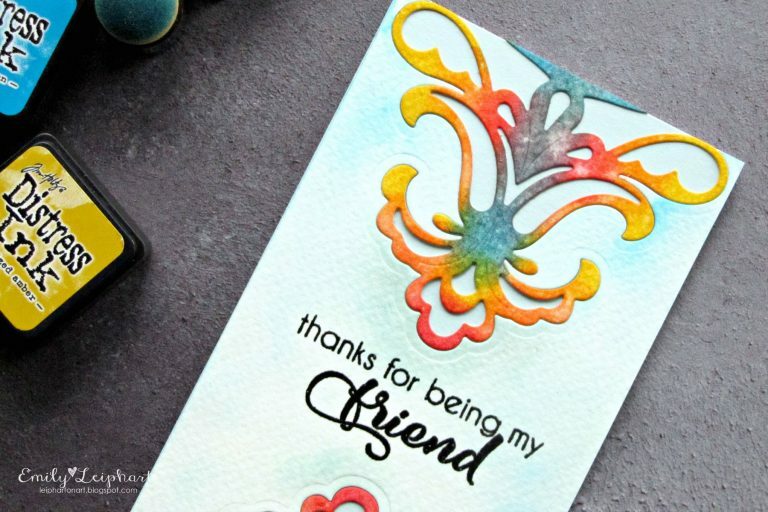 These dies are so intricate, there’s so much you can do with them, whether you use the entire die or just part of it. I haven’t made ultra tall cards in a while and 3.25″ x 6.5″ cards are my favourite card shape. The Kurbits 2 die lent itself perfectly to this shape so I made two of them to show how different they can look with small changes in materials and colours! For the first card, I die cut the bottom end of the Kurbits 2 die from both ends of the watercolour panel. 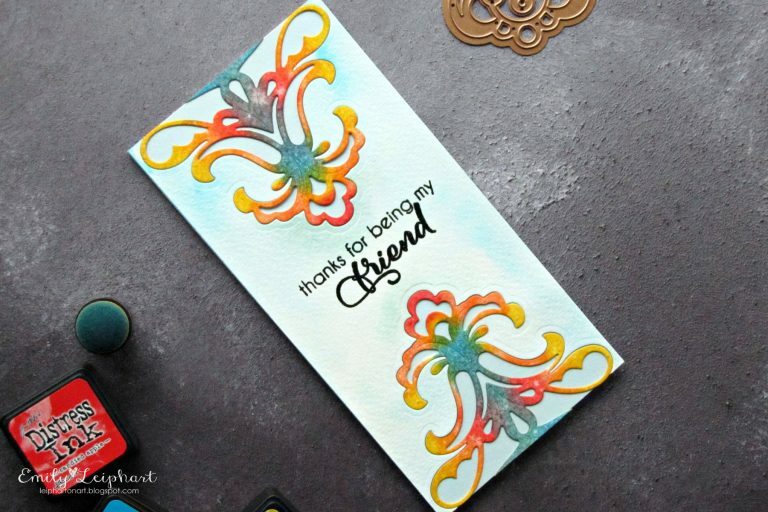 I chose this watercolour cardstock for its texture. Then I die cut the die twice from black cardstock to inlay it into the negative space. 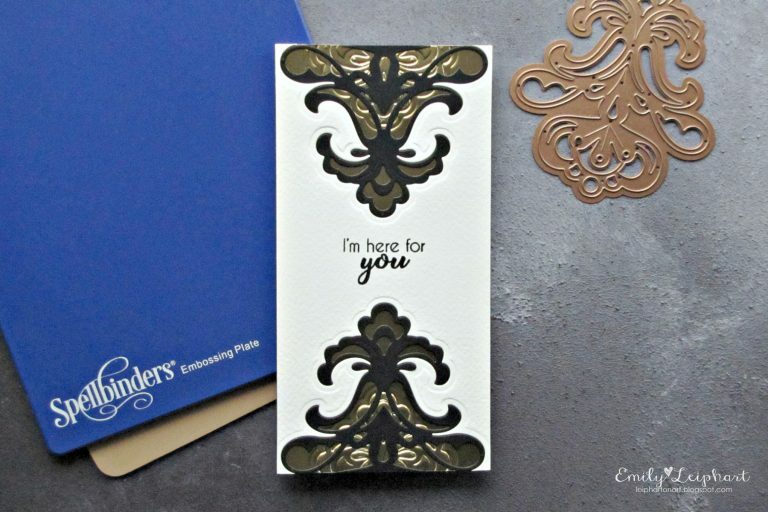 Next, I die cut a panel from gold foil cardstock included in the March 2018 Card Kit of the Month. Then I used the Platinum 6 embossing mat and plate to dry emboss the top end of the die on to both ends of the panel. 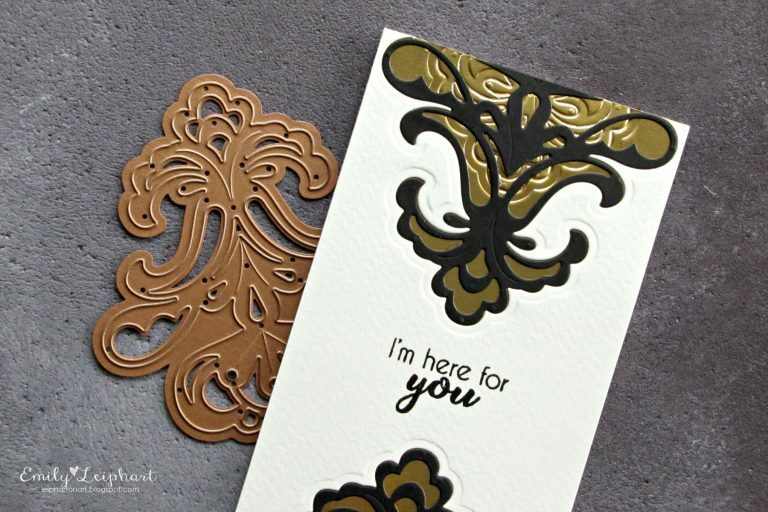 This beautiful embossing into the gold foil shows that part of the die design through the black die cuts that are inlaid into the watercolour panel. 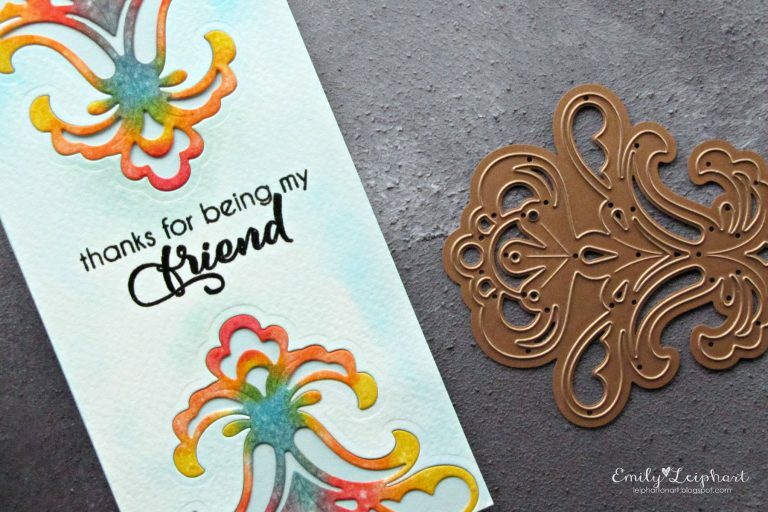 For my second card, I used daubers to sponge distress ink colours on to the Kurbits 2 dies, which were die cut from watercolour cardstock, then misted with water. The front panel was watercoloured with evergreen bough and peacock feathers distress inks. Instead of the gold, I used a panel of blue cardstock that blends perfectly into the watercoloured panel in the foreground. 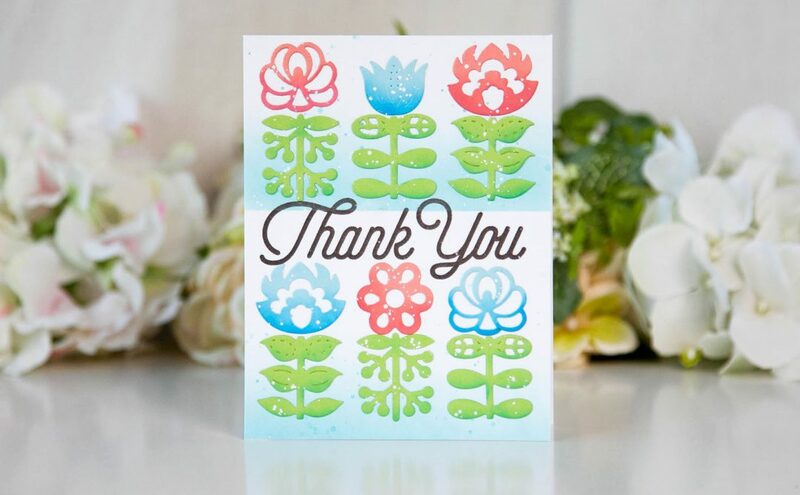 On both cards, I used simple but beautiful sentiments which complement the Kurbits 2 die perfectly. 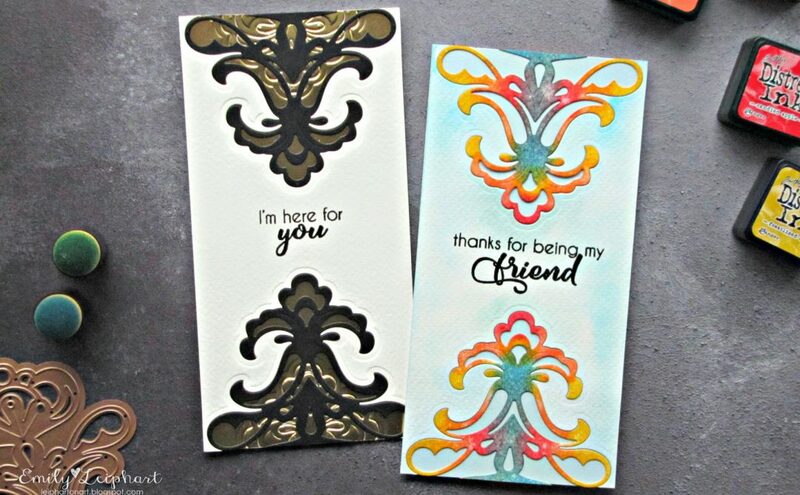 These were stamped with black pigment ink and clear embossed for shine and dimension. Thanks so much for stopping by today! 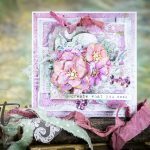 I hope you enjoyed my projects and I will see you again soon with more projects using dies from the Folk Art Collection by Lene Lok. 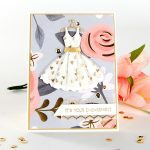 Fabulous cards – I love the rainbow one especially! 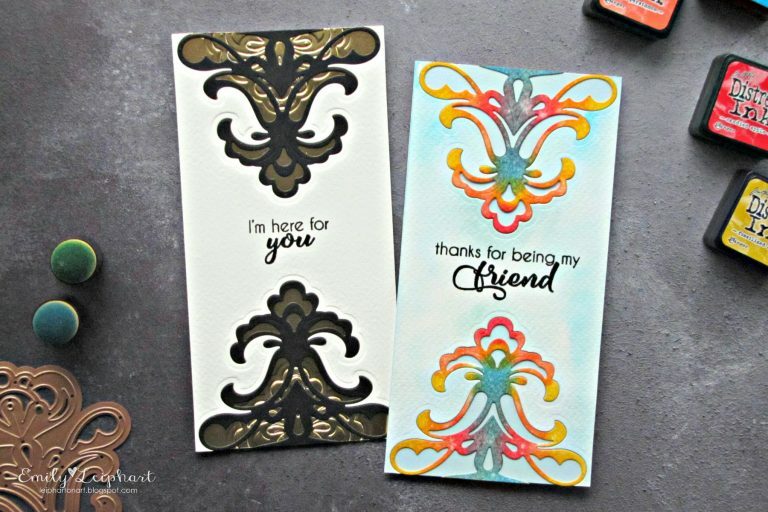 Two beautiful cards, each quite different than the other! 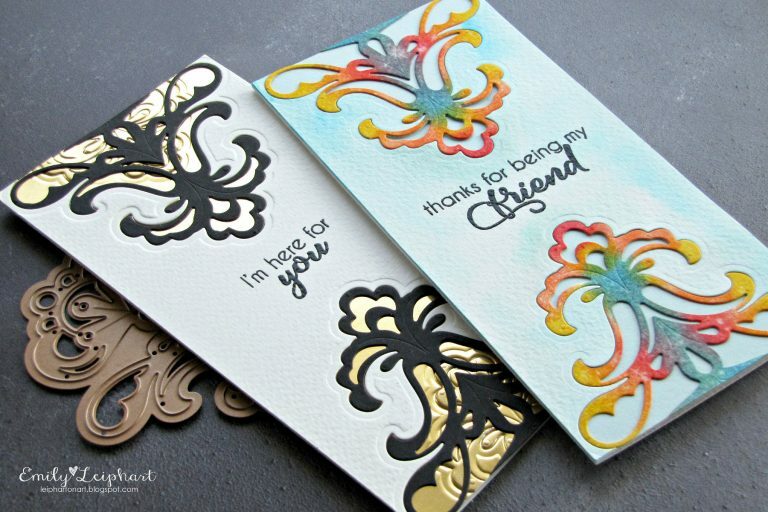 I like the elegance of the black and gold one (and that the dry embossing on the gold _almost_ makes it look like a face!) and the gorgeous colours of the watercoloured one. 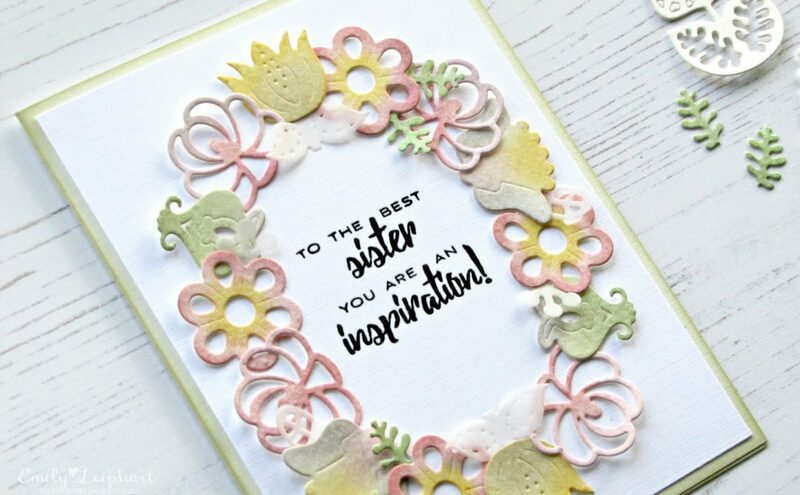 Great cards. I like the rainbow one the best.